Camino Bakery is not your typical “bakery” full of confections. It’s more of an urban/Boho/chic type of bakery where you can enjoy homemade artisan breads or healthy sandwiches followed by a wonderful homemade slice of cheesecake. Or the biggest slice of chocolate cake…EVER. You can enjoy them with a coffee drink, powered by downtown Winston-Salem’s beloved Krankies Coffee or with a nice glass of vino in the evening with a friend…or a craft beer. So NOT your typical bakery. I love the comfort of Camino Bakery. It’s very warm and welcoming. You can take up residence on a bench seat at a rustic table by the windows or a bar seat to watch street traffic and all the activity on 4th Street. Or you can even make a few friends at the little community table in the middle of the place. You’ll find folks of every persuasion…students with their laptops, older ladies catching up or maybe a family of foodies (that’s us!) grabbing a after-lunch treat. You really can’t go wrong with Camino’s chocolate chip “as big as your face” cookies after all. They are huge. Really, my two little ones can share them for 2 days. Well, I MAKE them do that. They promote their locally sourced ingredients and there’s a board in the middle of the shop to show you from whence it came. I am always thrilled to see the awesome Homeland Creamery from Julian, NC on a vendor list. Different breads are made daily depending on the day of the week. You can check out their website to see what’s being made any day of the week. Some things like Multigrain and White you’ll find almost every day. The menu also depends on the TIME of day as well. Morning is devoted to pastries and a sweeter selection of breads. At lunch, there are at least 5 types of fresh veggie-filled sandwiches every day along with quiche and a special focaccia and a very popular tomato pie. Of course, it wouldn’t be a bakery about the delicious confections! I will say that I tried the coconut swirl pastry and it was so moist and delicious and not too sweet. I didn’t have room for coffee but the pair would’ve been divine. If you are on Facebook, you can be tantalized by Camino Bakery’s page and drool over their dessert pics in the albums. They’re downright artistic, those photos. The place was jumping so I felt funny butting in and snapping away unannounced so I got a few shots in. 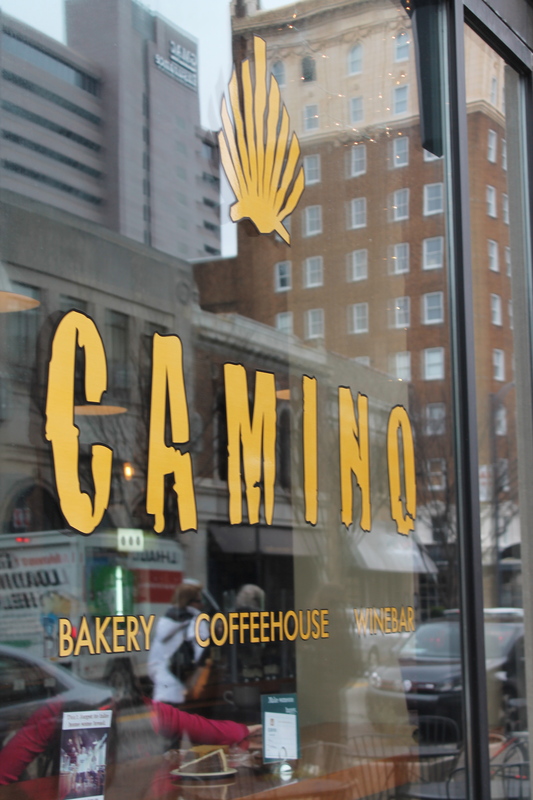 Owner Cary Clifford started Camino Bakery out of a passion for baking. She took her little treat-making business for Krankies and turned it into this little blessing of a bakery in 2011. You can grab a loaf or cheesecake to take home. They offer catering too. Mostly, it’s a great place for a fresh veggie sandwich, a morning pastry or a nice glass of wine with dessert. You’ll feel right at home in this cozy little spot in downtown. And unlike some places downtown, they are open on Sunday :). This entry was posted in Restaurants, You Should Eat Here! and tagged Dessert, Dinner, Downtown Winston-Salem, family friendly, Lunch on February 21, 2013 by triadfoodies. Camino’s is the real thing! My favorite cafe/bakery–wonderful quality, wonderful service, and wonderful atmosphere. Just like the best cafes in Europe, because it can be part of one’s everyday life, not just a place for special outings.